Inscriptions: u.r. handwritten in ink: "55 A"; u.r. handwritten in ink: "same colors as 55"; u.r. 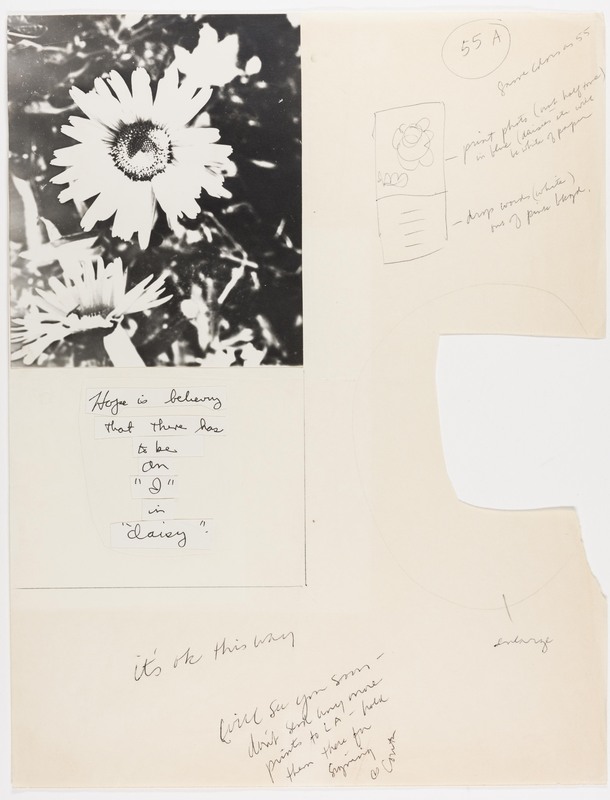 handwritten in ink: "print photo (not half tone) in blue (daisies etc will be white paper [sic]"; l.r. handwritten in ink: "drop words (white) out of pink bkyd. [sic]"; l.r. handwritten in ink: "enlarge"; l.l. handwritten in ink: "it's ok this way"; b.c. handwritten in ink: "will see you soon- don't send any more prints to LA- hold them there for signing / Corita"
"Untitled." Corita Kent in the Grunwald Center Collection. Los Angeles: Hammer Museum, 2017. https://​hammer.ucla.edu/​collections/​grunwald-center-collection/​corita-kent/​art/​untitled-preparatory-material-for-i-in-a-daisy/​.